Senior Pastor, Mark Boudreaux, is a gifted speaker with over 25 years of ministerial experience. His passionate, practical presentation of the word of God equips believers and impacts all who hear it. Under his leadership, LifeStone has thrived and will continue expanding ministries to reach out and minister to those in need. Marcus and Ashley serve as Campus Pastors. Together they focus on the growth and development of Lifestone Church. Both have a love for people and ministry. Marcus and Ashley are each local business owners and specialize in team development. Administrative Pastor, Kevin McCauley, is a successful local business owner. His leadership skills impact many both professionally and spiritually. Kevin has a heart for serving and is passionate about helping others. 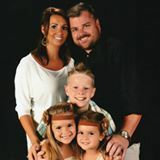 Prior to becoming Connection Pastor, he served as Youth Pastor for four years and as Family Pastor for two years at LifeStone Church. His wife, Desiree, is a 4th grade Teacher for Denton ISD, has a master's degree and years of ministerial experience. Together they have three beautiful children: Kaden, Pricsilla and Severyn. We would love to connect with you! Our current location is 201 East Mission Street, Denton, TX 76207. Our weekly service time is: Worship Service - Sunday at 11:15 am. Also, feel free to contact us with any questions or thoughts that you might have. You can reach us at 940-391-6778 or email us at info@youhavevalue.com. We look forward to seeing you soon!